The subject of memory has been on my mind a lot lately for several reasons, some personal (I had to watch my mother, also a writer, descend into dementia until she ultimately lost even the words she so treasured), some to do with my writing. The months spent writing Home Deadly Home, the beginning of my new romantic series set in a rural county in eastern Oregon, really set those thoughts to simmering. I’ve always known I have a fine short-term memory but long-term…nope. I was a librarian, but, sad to say, apparently I never developed a Dewey Decimal system for organizing my memories so that I could actually recover them. And then there’s the way we skew our memories without even knowing we’re doing it. I’m sure you know that eyewitness testimony is becoming increasingly suspect in criminal trials, replaced when possible with more indisputable forensic evidence. And yet, any investigation still relies heavily on who saw what, when, where... In other words, with the fallible memories of people like us. In Home Deadly Home many of the characters grew up together. Some never left town, some are recently home. The new sheriff, Grant Holcomb, led the small high school football team to their only state championship, a triumph that is still celebrated locally. Yet when he returns after a seventeen year absence, he discovers that even his friends remember those high school years differently than he does. Same events, different memories…and he has to wonder if one classmate’s memories are bitter enough to have driven him to kill. Meanwhile, duty and maybe love bring Cassie Ward home after her father’s stroke, and in a small town that’s hardly changed, it’s hard to evade memories of hurt and tragedy, especially after she takes a phone call from a murderer who wants the attention she can give him in the local newspaper. I love digging around in the memories of my characters. I can tangle at will, torment to my heart’s content, and finally heal old hurts, if I choose to. As with many of my Cape Trouble suspense novels, Home Deadly Home has a great deal to do with the community, long-ago relationships, triumphs and grudges. And if you’re a fan of the Cape Trouble books, never fear! Many of you have let me know not to forget poor Sheriff Mackay. Someday, he’ll have his own book. Desperation Creek is a new romantic suspense series from RITA award winning and USA Today bestselling author Janice Kay Johnson. 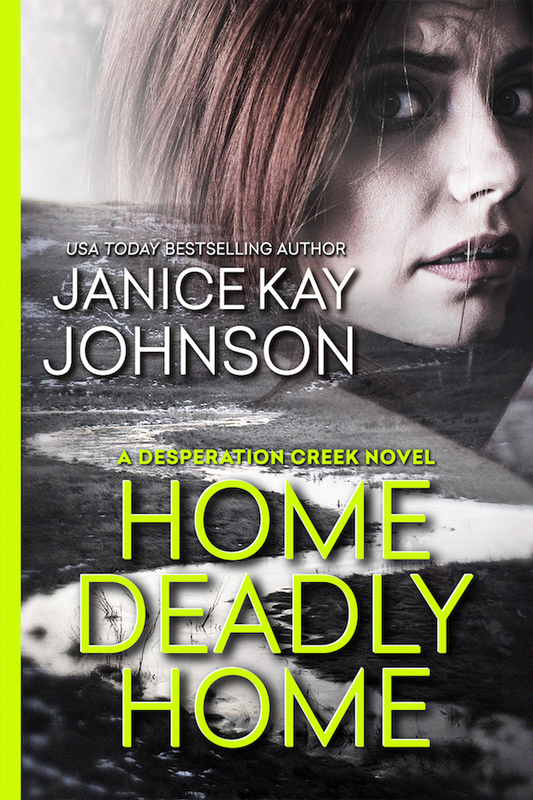 Known for delivering stories that combine strong, realistic characters, compelling mysteries and deeply emotional romances, Johnson follows her Cape Trouble series with Home Deadly Home, a gripping tale of murder, love…and the ominous shadow cast by the past. Desperation Creek winds through stark, high desert country once known for cattle ranching. But a dying way of life means police are spread too thin, empty roads are bordered only by rusting barbed wire fences and sagebrush, and memories of the glory days barely keep desperation at bay. After her painful childhood spent in Fort Halleck, Oregon, Cassie Ward longed to escape. Yet when her father needs her after he has a stroke, she reluctantly returns to take over the county’s weekly newspaper. An anonymous caller promises her a “real” story if she’ll go see a cattle rancher…who has been brutally murdered. Cassie complies when Sheriff Grant Holcomb demands she hold back horrific details from her reporting, but when the body count rises, she becomes determined to uncover the truth – whether the sheriff likes her involvement or not. Grant had been grateful to return home after a seventeen year absence. He’s seen too much death overseas and as a big city cop, but times have changed even here. He’s falling in love with a woman who is not only still desperate to escape the town he sees as home, she has a dangerous connection with a madman using her to ensure headlines for his killing spree. Are the deaths part of a battle for leadership of the revolt against federal control of large swaths of western lands? Or is this killer motivated by long-boiling resentment that overflowed once, like Cassie and Grant, he came home again? And if so, what part will they play in his deadly plan? Seen Janice's giveaway on the JUST ROMANTIC SUSPENSE SHOWCASE! I bought and read this last week! I love your books, and this one is great also! I can't wait for the next one!